Students can rarely have seemed so enthusiastic about receiving a textbook. Even though it was not a school day, dozens of them made their way in to Sisowath High School in the centre of Phnom Penh for a presentation ceremony. 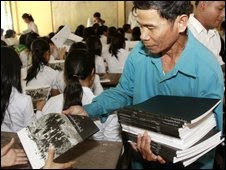 School and government officials were formally handing out the new Khmer Rouge history book, a scene that will be repeated across the country in the closing months of this year. Three decades have passed since the fall of the Khmer Rouge government. Yet only now are Cambodian schoolchildren finally starting to learn about what happened during the Pol Pot era. As many as two million people died in the late 1970s from forced labour, malnutrition and the summary execution of so-called "enemies of the revolution". But the subject was conspicuous by its absence from the high school curriculum until the new textbook received official approval. At Sisowath High, the students enthusiastically fired questions at the book's author and an official from the ministry of education. They asked "Who were the Khmer Rouge?" and "Why did they kill their own people?" These are the kind of things which one might have thought they would already know. But official information has been thin on the ground. Until now the official school text contained a mere five lines on the Pol Pot era. Khamboly Dy has expanded that paragraph to an entire textbook for the Documentation Centre of Cambodia, an organisation which gathers evidence about Khmer Rouge atrocities. 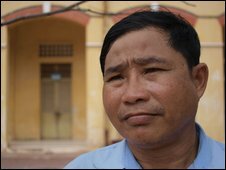 Like most Cambodians, he was born after the fall of the Khmer Rouge - but he insists young people must not ignore the subject. "After the Khmer Rouge regime, Cambodia was so damaged and fragile - like broken glass," he says. "The young generation has the responsibility to repair this broken glass. They need to understand what happened in their country before they can move forward to build up democracy, peace and reconciliation." Teaching the Khmer Rouge era has not been straightforward in Cambodia. The subject disappeared from the curriculum in the early 1990s when Pol Pot and his followers were among the signatories to a peace agreement. A series of defections and the presence of former Khmer Rouge members in the current government mean it is still a sensitive issue to tackle. So the new textbook is careful to concentrate on the grim facts of the Pol Pot era, rather than any political analysis. And that has ensured its official approval. There are chapters titled "forced labour", "purges and massacres" and "interrogation and torture" - but no explicit photos. Seventeen-year-old Rina was among the first students at Sisowath High to receive the textbook - and looked forward to closing the gaps in her knowledge. "I feel regret and guilty about this; they killed a lot of people," she explained. "The new textbook will give me the experience of what happened in Cambodia - and Cambodians will never let this happen again." The absence of the Khmer Rouge era from the school curriculum meant young Cambodians had been relying on older family members for information. Researchers discovered that some found the horrific stories barely believable, and cast doubt on whether the atrocities actually happened. Those attitudes may now change. Sisowath High School history teacher Im Sao Sokha will be among those using the new textbook to guide students through Cambodia's bloody past. "I lived through this period myself," he says. "No other country killed its own people like this - it was a disastrous episode in Cambodian history. If they understand what happened during the Khmer Rouge, students will change their attitude. They won't get involved with conflict, violence or fighting with each other." It is a lot of weight to put on a single textbook. But at the very least it should help to ensure that young Cambodians have the full details of the events of the Pol Pot era. What happens next is up to them. Cambodian and UN officials met on Wednesday for general talks on the Khmer Rouge tribunal, including the budget, as the UN-backed court prepares for a complicated trial and still faces shortfalls in funding. Council Minister Sok An met with UN Assistant Secretary-General for Legal Affairs Peter Taksoe-Jensen in Phnom Penh as part of a “routine consultation,” a tribunal spokesman said. Taksoe-Jensen ended three days of talks on Wednesday, having met with Sok An, tribunal officials and non-governmental organizations. No details of the meeting were released, but the tribunal budget was “part of the discussion,” the spokesman, Lars Olsen said. Phay Siphan, a spokesman for the Council of Ministers and head of a task force on tribunal negotiations, said the talks covered cooperation between the government and the UN and the results of the trial of Kaing Kek Iev, or Duch. The tribunal is now preparing for its second case, against all five jailed leaders of the regime, which promises to be more complicated than that of Duch. Tribunal observers have noted that the court has had difficulty gaining the confidence of many donors and still labors under allegations of corruption. It has also had difficulty calling senior government officials to testify. Officials have said the new budget includes provisions for the arrest of five more suspects, a move Prime Minister Hun Sen has warned could lead to instability. Khmer Rouge tribunal administrators have completed a budget request for the next two years that anticipates the possibility of further indictments, an official said. The indictment of more leaders of the regime is politically controversial, with Prime Minister Hun Sen and Cambodian judges contending further charges could endanger national stability. The proposal has been sent to UN headquarters in New York and will be presented to donors “very soon,” he said. The Extraordinary Chambers in the Courts of Cambodia, or ECCC, the official name of the tribunal, was originally budgeted at just $56 million. That figure proved less than enough, and the tribunal has found itself in fiscal trouble on several occasions. Donors have already approved a $143 million round of funding that was to last through 2011, but monitors for the UN-backed court say the new figure is larger and would carry the tribunal through 2012. “Based on the latest developments, we have seen that at present the ECCC is negotiating with key donors,” at least five countries, said Latt Ky, who monitors the tribunal for the rights group Adhoc. The exact figure remains a secret, he said. A US State Department official said a new budget is being reviewed by Congress. The US has so far provided $1.8 million for the UN side of the court, following measures by the tribunal to deal with ongoing allegations of corruption. The names of the five suspects who could face indictment by investigating judges have not been publicly released. But one who could face charges is Meas Muth, a former Khmer Rouge commander who is now an adviser to the Ministry of Defense. He has said he will go to the court if summoned, but he denied any wrongdoing in Khmer Rouge atrocities. A second possible suspect, Im Chaem, a Khmer Rouge district chief who is now a deputy commune chief in a former rebel area in Oddar Meanchey province’s Anglong Veng district, has said she will not cooperate with a court summons. The court has so far only undertaken one trial, of Tuol Sleng prison chief Kaing Kek Iev, or Duch, and is currently holding four other former leaders: ideologue Nuon Chea, head of state Khieu Samphan, foreign minister Ieng Sary and social affairs minister Ieng Thirith. The tribunal is preparing a case against the latter four that is expected to commence in 2010. Many of those observing the proceedings before the ECCC may have wondered about the most permissive cross-examination rules practiced by the Trial Chamber (‘TC’). In fact, very few restraints have been observed to what seems to have been the court and the parties’ unfettered power to cross-examine. Before any further discussion of the matter it is salient to acknowledge that there are no spelled out restraints for cross-examination in the Internal Rules (‘IRs’) of the ECCC pertinent to the proceedings before the TC. This unfortunate omission by the drafters and the judges themselves, however, should not result in an unfettered grant to cross-examine as there are cross-examination rules which have been developed by other known jurisdictions and at the international level. Under these rules – which vary somewhat from jurisdiction to jurisdiction – parties may raise objections based upon a set of prescribed grounds. One of such grounds is leading questions. The legal community has a reasonable understanding of what constitutes a leading question, although there might not be specific grammatical structures which such a question has to fit to be objected to as a leading question (many lawyers, if asked what constitutes a leading question, will answer “you will know it is a leading question when you hear one). Ultimately, however, it is the presiding judge within whose authority it is to determine which question is leading and which is not in response to an objection raised by a party to the proceedings. The Duch trial up to this point has been a cornucopia of unrestrained leading questions. In some cases (e.g. Chan’s testimony) lawyers raised objections to specific lines of questioning or specific questions, however, to no avail as the TC shied away from setting rules in every instance such an objection was raised. This practice has had a negative effect on the proceedings which has yet to be evaluated. This is particularly unfortunate in Duch’s trial where the accused has been generally in agreement with the charges against him and on the whole has not denied the core of the culpability theory designed by the prosecution. As it was previously argued on this forum, under other circumstances Duch would have been either plea-bargained (in the US system) or his trial would have been cut down to the short possible period. This is not the case before the ECCC to which the search of correctness of historical record – at times at painful detail-level which is unimaginable to have any adducible evidentiary value – seems to have taken precedence to the finding out whether there is sufficient evidence to prove the accused’s guilt as charged by the prosecution. The fact that leading questions are rarely objected to and never suppressed and the prosecution’s statement which declared the possibility of prosecution of witnesses “remote” gives the witnesses in this case an incentive to simply say ‘yes’ to some of the leading questions which, as the defense very correctly noted, might have implications for the witnesses under the Joint Criminal Enterprise (‘JCE’) theory.